Learning Is Our Job… it’s not just me (or us). You can see my response to the original message above (with poor syntax– but is it grammatically incorrect?). 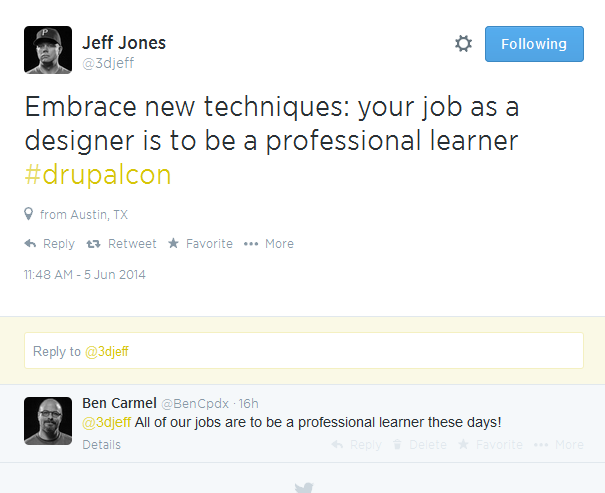 No, our careers are now tied to learning. And learning is not a solitary endeavor. We learn only in so far as we can seek, catalog, retrieve and share new facts, ideas and methods. That’s where I see us PD/L&D/ID/ELP/SPOTDA* folks gaining in relevance. Most of us are at a loss on how to take that learning management, or Personal Knowledge Management (PKM, in the parlance of our day) from a chaotic hit-or-miss activity to a systematic practice. Nobody taught us how to learn in the digital age, but it is an – the – essential challenge of our careers. ← Setting the Course: Do we still need e-learning courses?